President Pratibha Patil has been provided a Mercedes Benz S600L Pullman, an armoured car whose special protection features provide cover from military-standard small-arms projectiles and fragments from hand grenades and other explosives, sources said.They said the President’s limousine has been upgraded after nearly eight years. Officials at Rashtrapati Bhawan and Mercedes Benz declined to comment on the issue. The cost of the car is estimated to be around Rs 6 crore. The sources said the new vehicle for the President was purchased around the middle of this year and it took one year to build the special-protection vehicle — whose safety features include the ability to run on flat tyres, a self-sealing fuel tank and a fire-extinguishing system. Rashtrapati Bhawan has purchased the vehicle to be used only by the President, the sources said. Like the luxurious and spacious open-plan Pullman railway coaches after which it is named, the S 600 Pullman Guard has huge space for a comfortable journey. The vehicle owes its spacious interior to its 4315mm wheelbase, which is 115 cm longer than that of the long version of the special-protection S-Class. With an overall length of 6356 mm, the vehicle has a space for discreet meetings and is equipped with state of the art communications and entertainment systems. It is powered by a twelve-cylinder bi-turbo engine with a displacement of 5513cc and an output of 517 horse power. This gives it enough power to effortlessly steer through danger zones and troubled areas in case of emergency situations. Mercedes Benz had showcased the S600L Pullman at the Delhi Auto Expo in 2010. Among other features, the car offers a special air intake system which can circulate fresh air even if there are poisonous gases around. Keeping in view the President's need to interact with state guests and other high-level dignitaries while on the move, the seating has been designed to enable passengers to sit facing each other. A partition between the driver's seat and the passenger compartment has been added to ensure privacy. Sources said all the top luxury makers, including other German majors such as Audi and BMW, had made a pitch to deliver the state vehicle, considering the prestige and status attached to it. Prime Minister Manmohan Singh uses a two B5-level armoured BMW 7 Series car. 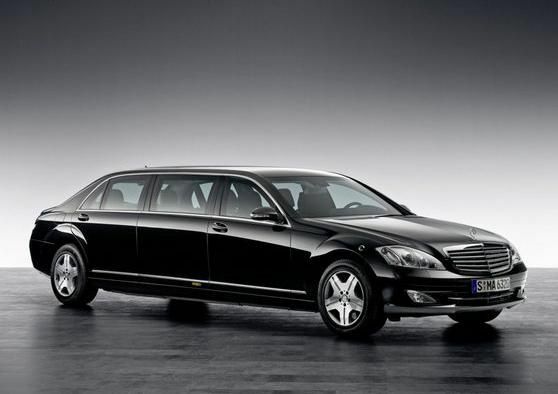 For the Mercedes-Benz S 600 Pullman Guard, the developers designed about 550 new components made from steel alone. They all join together with the body shell of the Pullman to create a fully-enclosed cell which is self-supporting and reinforces the vehicle. This is one of the key factors behind the vehicle's durability. The state limousine is equipped with a higher rear roof for easier access and greater headroom.